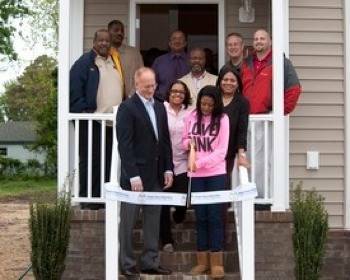 Newport News Shipbuilding (NNS) division recently dedicated its 11th Habitat for Humanity house in Hampton. NNS has partnered with Habitat for Humanity Peninsula and Greater Williamsburg since 2002 to build homes for families in Hampton Roads. In the picture: Ron Murray (front left), Newport News Shipbuilding's vice president of quality and process excellence, watches as Treasure Wynder cuts the ribbon to her family's new home. Behind Treasure are her sister and mother, Shakira and Shereen Wynder. Also pictured (left to right) are Michael Lee, vice president, United Steelworkers Local 8888; Shereen's father, Teko Wynder; the Rev. Cecil Collier; Steve Brown, Hampton Redevelopment and Housing Authority; David Hancock, president, Habitat for Humanity board of directors; and NNS employee Jeremy Scicchitano.